:How can blowing a horn win a battle? Gideon listens to God and leads an army to victory in a surprising way in this Bible story. 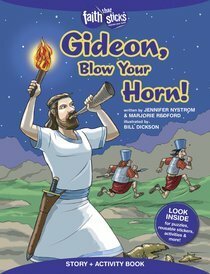 About "Gideon, Blow Your Horn! (Incl. Stickers & Puzzles) (Faith That Sticks Story & Activity Book Series)"
Marjorie Redfordhas years of experience in children's ministry, curriculum development, and writing for children. She is also a Children's Product editor for Standard Publishing.Courtney Riceis an editor at Standard Publishing and co-author ofI&#160;Love Church!andGod's Special Rule.Kathryn Marlinhas illustrated several children's books including My Bible Says.